The Mishnah of the Week is something that all ages can learn from. It reminds us to look deeper, beyond what we see on the outside. Young children can begin to understand this but it is most important for young teens. Rabbi Meir was a wonderful teacher who really learned from all people. When his teacher was called a heretic, Rabbi Meir was said to have the ability to “take the fruit and discard the peel.” What does that mean? Can we really learn from all people? This mishnah seems very simple but that means we need to look very carefully. What does it mean to not look at the jug but at what is inside? How do we do this all the time in our daily lives? Talk with your children about how we sometimes are fooled by the way things look on the outside. What are some examples? Is this mishnah the same as or different from this common saying: “Do not judge a book by its cover”? Spend time talking with your children about different examples of this mishnah. Does this apply to people as well? How? Temple Shalom Sisterhood hosted its annual Woman of Valor event at Bent Tree Country Club May 15. Honoree Ilene Zidow was chosen for her active role in Sisterhood and the community. Event Chair Wylee Protas and committee members Ann Weintraub, Keo Strull and Linda Young took Ilene for a stroll down memory lane with their creative planning and heartwarming slide show. The ballroom was filled with friends, family, past Women of Valor and residents from CHAI (Community Homes for Adults, Inc.), where Ilene is a member of their board of directors. One of the highlights of the afternoon was Sisterhood’s presentation of a check to Jim Liston, president of CHAI, in Ilene’s honor. Ilene has made it her mission to bring women together, stating, “My role model and mentor was my sister Carolyn Cooper (of blessed memory), our Sisterhood 2002 Woman of Valor. I had never heard of this before, but I recently learned that it’s a yearly ritual for members of Congregation Shearith Israel in New York City: They go back to their roots in what is now Chinatown, to their synagogue’s original cemetery, to honor the 20-some members buried there who fought in the American Revolution. Shearith Israel, known as the Spanish and Portuguese Synagogue, was founded in 1654 by 23 Jews whose origin was in those countries, and had made their way north from their seminal settlement in Recife, Brazil. The story of honoring those long-dead patriots was recently told by today’s spiritual leader, Rabbi Dr. Meir Y. Soloveichik, the 10th in that position since the congregation’s beginning. The most striking part of Shearith Israel’s history, he says, is that in the New York of that time, most loyalties were with England; hundreds of residents had actually signed a “Declaration of Dependence” affirming their allegiance to Great Britain. But most of the city’s Jews followed the lead of Gershom Mendes Seixas, who headed the congregation at that time. He had started with the synagogue as cantor in 1768, at age 23. Without formal training — there was no Jewish seminary in the U.S. then — he learned “on the job,” as it were, to become its spiritual leader. And since he was not an ordained rabbi, he was called “Minister,” which is the way Shearith Israel often refers to its clergy, even today! Seixas had his flock pray together for the English to “turn away their fierce wrath from against North America,” but when that prayer wasn’t answered, Shearith Israel took this bold stand, which is part of the synagogue’s record: “… It were better that the congregation should die in the cause of liberty than to live and submit to the impositions of an arrogant government.” Most of its members then moved — taking their Torahs with them, of course — to the nearby, definitely patriotic city of Philadelphia. But its “minister” was still ministering even to those Jews who sided with the British and remained in New York. One of them was Samuel Lazarus; when he needed a Jewish clergyman to perform his wedding, Seixas risked his life by sneaking back into that city to officiate. How ironic that one of the descendants of that clandestine ceremony was Emma Lazarus, who wrote the poem now engraved on the Statue of Liberty’s pedestal, welcoming immigrants to their new home in America! Today, the congregation’s annual pilgrimage across Manhattan includes a color guard; then, at the cemetery, American flags are placed on all appropriate graves. And there’s always a very special moment at the spot where Jonas Phillips is buried; he was the member who wrote to George Washington during the 1787 Constitutional Convention in Philadelphia to complain that Pennsylvania would not let Jews serve in its state legislature because they would not accept the New Testament. In his letter, Phillips said, “The Jews have been true and faithful Whigs, and during the late contest with England they have been foremost in aiding and assisting the States with their lives and fortunes. They have supported the Cause, and have bravely fought and bled for liberty which they cannot enjoy.” Thanks to him, religious requirements for public office were done away with — not just in one state, but for our whole country. Shearith Israel does its annual honoring on Memorial Day, but heading toward July 4 is a good time for us also to think about past Jewish heroes. We have been discussing the status of the human body in the eyes of Judaism, in the last column explaining that the upper spheres created by God are in the spiritual image of the body of man. We left off with the question of: Why would the Al-mighty establish His hierarchy of spiritual worlds in such a fashion? The Kabbalists explain that God did so because He desired that mankind would be God’s partner in the perfecting of the universe. Man’s choices should not merely make a local impact within each individual’s recognizable sphere of influence. Man’s actions should, rather, have a global impact, making a difference throughout the universe. Man is referred to, in the words of the early Sages, as a microcosm, a living miniature of the entire universe. The Mishkan, or Portable Temple, is also referred to as a microcosm of the universe in space. Every limb, organ and sinew of Man corresponds to a vessel, stitch or panel of the Mishkan, which was created as a miniature universe of holiness within the larger universe which is stained by impurity and misdeeds. The fact that every part of the body of Man corresponds to a part of the universe, including the upper spiritual worlds, endows Man with immense influence over the entire universe through his choices and actions. In order to empower Man with such a magnitude of influence, the Al-mighty did not merely create the body of Man to correspond to the upper worlds and universe. He, rather, created Man at the very end of creation (on Friday, the final day), in order to include some fiber of every part of creation within Man. Man and the universe are hence inextricably interwoven into one unit. The uppermost fragment of the soul of Man towers above all other spiritual worlds to ensure that the actions of Man will impact all of the spiritual worlds, as Man’s soul traverses all of those worlds from its highest place down to the body of Man himself. Depending on what type of action one does, which part of the body takes part either in the mitzvah or, God forbid, the misdeed, that action will very specifically affect the part of the world or universe connected to that part of the body. This is the meaning of the statement of the Talmud that the number of mitzvos of the Torah corresponds to the number of body parts. The mitzvos, which are the specifics of the Torah which the Zohar calls the “blueprint of the world,” are deeply connected to every part of our body and are the “wires” which connect our bodies to every part of the world and universe. A further corollary to this is that our bodies are not merely arbitrary vessels which are attached to our souls. Rather, each body is custom-made to its soul, fine-tuned to its intricacies. The human body is the instrument by which each soul plays its unique music as an integral part of the orchestra of life. It is the vehicle by which each distinctive soul plays out its unique mission during its time in this world. This understanding opens the door for us to begin to fathom the spiritual distinctions between the male and female bodies. The physical contrasts and dissimilarities between the male and female bodies express a spiritual divergence. As we have seen, every minute iota of our bodies hints to a supernatural connection to the highest of spiritual worlds. This is certainly true with regard to the polarity, in many respects, between the male and female bodies. Before we can justly explore the question of “gender fluidity” and the transferral of one’s body to reflect the gender of one’s choice, we must first understand the diverse spiritual messages which are broadcast by the two bodies. We will attempt to examine these messages in the following column. Another round of fruitless Israeli-Palestinian negotiations? Prime Minister Benjamin Netanyahu met with U.S. Secretary of State John Kerry in Rome on June 26 to discuss ways to revive the all-but-dead Israeli-Palestinian peace efforts. After discussing details of the rapprochement between Israel and Turkey, Netanyahu told Kerry that he prefers a current Egyptian-led effort to revive negotiations, rather than the international approach being pushed by France. It’s really a no-brainer politically, because the general assumption is that most people in Western democracies prefer peace to war, and believe (completely erroneously!) that the Israeli-Palestinian problem is the root cause of all regional conflicts. However, after five wars, years of terrorist attacks, months of failed negotiations, numerous broken promises, repeated land concessions by Israel and plenty of blame to go around, there are two schools of thought on how to bring that about. First some definitions: The political terms “left” and “right” used here are the Israeli definitions, and refer to ideological and political views on the best way to assure Israel’s security and long-term survival: “Right” is more conservative (hawkish), while “Left” is more liberal (dovish). In both cases I’m talking about normative Israelis and Americans, who support Israel and the Zionist dream and understand the need for an eventual resolution to the conflict, but have different opinions as to how to make it happen. Note: I’m not talking about the extreme, sometimes violent fringes of both camps. On the “right” — mainly secular and religious conservatives who feel that Israel should maintain a tough, noncompromising negotiating posture leading to perpetual Israeli sovereignty over most of the areas of Judea and Samaria, while establishing a less-than-fully sovereign Palestinian nation-state that includes the Gaza Strip, is demilitarized and formally recognizes the Jewish State of Israel. On the “left” — secular and traditional liberals who prefer compromise-driven negotiations that would essentially return most of the West Bank to the PLO with Israel maintaining permanent security control over the Jordan Valley and other small areas crucial to Israel’s ongoing and evolving security needs. Israel will also maintain most of the established Israeli communities (settlements) that are within the four “Consensus Blocs,” in exchange for agreed land swaps of equal area. Here, too, the ultimate goal is a demilitarized Palestinian nation-state that recognizes Israel as the historical and current sovereign Jewish homeland. Israelis tend to vacillate between the camps, with most not fully committed to either. Many will lean one way or the other at any given time, based on either perceived threats, like war or terrorism, on the one hand … or real movement toward peace on the other. The government of the day has a major influence on national leaning. But since the government is elected by the voters, we have an interesting chicken-or-egg question … or do we? The fact that in recent elections Olmert, Sharon and Netanyahu were able to cobble together right-of-center coalitions has less to do with general sentiments among Israeli voters, who are basically centrist, and more to do with the fact that the traditional leftist parties keep breaking up and reinventing themselves with no coherent or unified platform or legacy leadership. On the other hand, the Likud party, with few changes, has anchored the right wing of Israeli politics since 1973. Today, Netanyahu heads a solid coalition of Likud and like-minded coalition partners. Any proposals that Secretary of State Kerry, and/or the Egyptians, will come up with this week will be negotiated from Israel’s “right-of-center” philosophy regarding security and boundaries. That fact, combined with the current Palestinian leadership vacuum and ongoing rejectionist statements, make me feel pretty safe in predicting that this will just be another round of fruitless negotiations. Agree or disagree — that’s my opinion. Gil Elan will continue to write his biweekly column for the Texas Jewish Post, as well as his weekly briefing for Southwest Jewish Congress members. DALLAS­ —­ Gil Elan, president and CEO of the Southwest Jewish Congress, is moving to Israel to spend more time with his family — particularly his grandchildren. But the 69-year-old said he is neither quitting nor retiring from his SWJC duties. He isn’t shirking his responsibilities as a Middle East analyst or abandoning his post as a columnist for the Texas Jewish Post. If anything, Elan said, he is stepping up his game. Learning about podcasting. Embracing the digital age. Elan reminisced about his family, his youth, and Israel at the SWJC’s annual meeting at Temple Shalom from 6 p.m. to 8:30 p.m. Wednesday, June 15. He ultimately bid this large audience a fond farewell — at least until he resumes his Middle East briefings to the Dallas-Fort Worth area’s Jewish community in September. He’ll be using Skype to broadcast that long-distance message from Israel. Elan said Skype will be used to provide his signature Middle East briefings to the Aaron Family Jewish Community Center of Dallas, Congregation Ahavath Sholom in Fort Worth, and The Legacy Willow Bend senior living residence in Plano. “Susan will teach how to hook up to projectors and we’ll have a few dry runs before I leave,” Elan said. However, Elan said podcasting — creating a digital audio or video file or recording that can be downloaded — will be used to provide his audience with short updates on current events. “People will be able to just hook up their earphones, click on my podcast and listen,” he explained. Elan said both Skype-ing and podcasting will allow him to continue to reach his audience in the same basic time frame as before. Elan, a former lieutenant colonel in the Israel Defense Forces, is a widely regarded expert on Israel and the Middle East. He has written multiple articles and columns on the subject. His biweekly TJP column combines his knowledge and wit into easy-to-read analyses on current events. 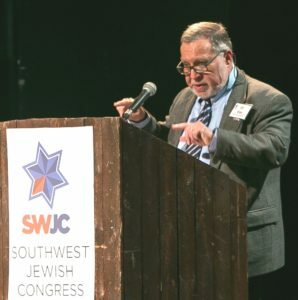 Elan said he will officially continue his work with the Southwest Jewish Congress after moving to Israel — although Susan Myers, executive director, will direct SWJC operations from North Texas. Elan — who has been married to his wife Esty for 45 years — has had years of pro-Israel advocacy experience in the United States. He said he will be continuing his work after moving to Israel because it is very important. And, quite frankly, Elan enjoys it. He considers it fun. Elan said he and some members of his family — his wife, his daughter, son-in-law, and four of his grandchildren — are moving to Tirat Carmel, a city in the Haifa District in Israel. “I will be on the beach, where we will live,” Elan said. Elan has seven grandchildren — his daughter’s four kids and an additional three from his son, who lives in Sarasota, Florida. Elan said he and his family leave Dallas around July 12 or 13 and will drive to Sarasota, where they will spend the week with his son and his son’s children. On July 28, Elan will leave his vehicle in Sarasota. He and his wife, daughter, son-in-law, and four grandchildren will then fly straight to Tel Aviv. Meanwhile, the SWJC held annual elections during their Wednesday, June 15 meeting. The following 2016-2017 slate of officers was selected: Harry Ploss, founding chair; Jonathan M. Spigel, chair; Susie Salfield Avnery, Bruce E. Bernstien, and Nelda Golden, vice chairs; Keo Strull, secretary; and Mel Meyers, treasurer. The following members of the 2016-2017 board of directors were selected: incoming member Hilary Blake; Richard Barrett-Cuetara; Gordon Cizon; Lauren Cohen; Michael B. Cohen; incoming member Laura Ermini; Andy Farkas; Ardo Fuentes; Michael B. Glazer; Robert Alan Goldberg; Stan Golden; Janet S. Goldsmith; Mark E. Jacobs; Marla Greenberg Janco; Cindy Ray; Dr. Marion Sobol-Helgason; Rose Marie Stromberg; incoming member Alan Tolmas; and Jenny Walters. Last month at the general membership meeting of Dallas Post No. 256 of the Jewish War Veterans of the USA, the guest speaker was one of its own members, a veteran like the others, but with a unique perspective, being the only West Point graduate in the bunch. Ken Parker, class of ’57, spoke of his experience especially from the viewpoint of being one of the few cadets who were Jewish. “No anti-Semitism all the time I was there and no complaints by any of the other Jewish guys as well,” Ken reported. As a devoted alumnus, Ken keeps up with developments and in a recent phone conversation with the Jewish chaplain at West Point, he was reassured that there were no signs of any anti-Semitism. All well and good, I thought, but what about the other four academies? I went “Google crazy” checking back years for any complaints at Annapolis (Navy/Marines), Kings Point (Merchant Marine), New London (Coast Guard) … no issues, but when I reached the Air Force Academy in Colorado Springs, it was quite a different story. Colorado Springs, at the base of Pikes Peak and the Rocky Mountains, is not only a popular tourism center, but it is also the home of a large military establishment which includes the Air Force Academy, the North American Air Defense Command, and the Army’s Fort Carson, plus two nearby Air Force bases. It appears that they are competing with each other, spreading their Christian zeal through the local civilian community, but primarily through the ever-present military. Complaints that supervisors at the Academy pressure cadets to attend “training” sessions where they receive the “word” of Jesus as their one true leader were explained away as attempts to build cohesiveness. Many investigations and review boards have failed to solve the problems that Jewish cadets face when they enter the Air Force Academy, but hope lies ahead. Bulletin: On July 1, 2016, General David Goldfein, a battle tested command pilot and a Jew, will become the leader of the U.S. Air Force. 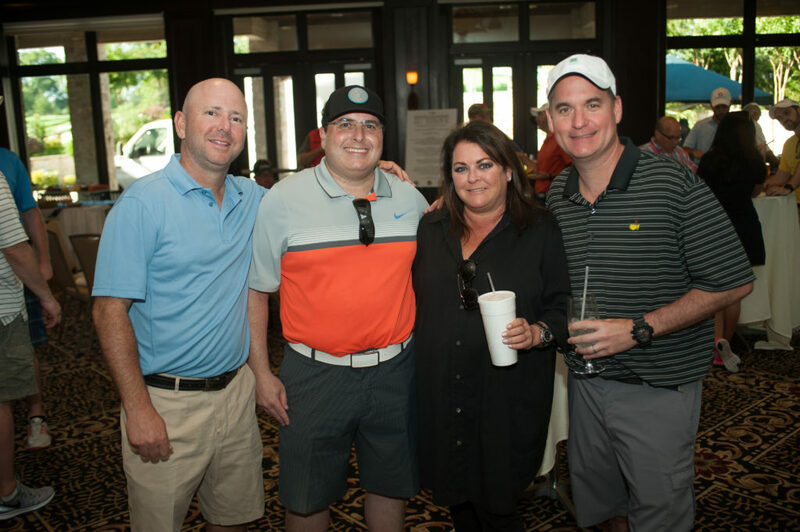 The 29th Annual North Dallas Bank & Trust Co. & Crest Cadillac Infiniti/Erwin Waldman Memorial Golf Tournament was held Monday, June 6, at Coyote Ridge Golf Club. 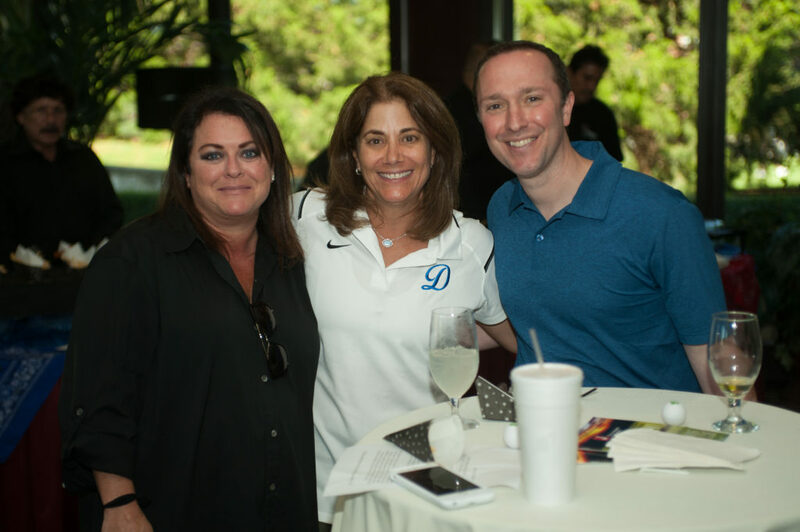 For almost 30 years, the Jewish Community Center of Dallas has marked the beginning of summer by hosting the Erwin Waldman Memorial Golf Tournament. This year, the skies were blue, the sun was out and the golfers were ready to enjoy the day, truly playing for the kids. The tournament is more than a day to enjoy golf. The 138 golfers who participated played for the opportunity to do something special for children and families, many of whom are less privileged. Through sponsorships and raffle proceeds the funds support scholarships for children to attend camp. Each year the J receives more and more requests from families for scholarship assistance to attend camp and preschool. 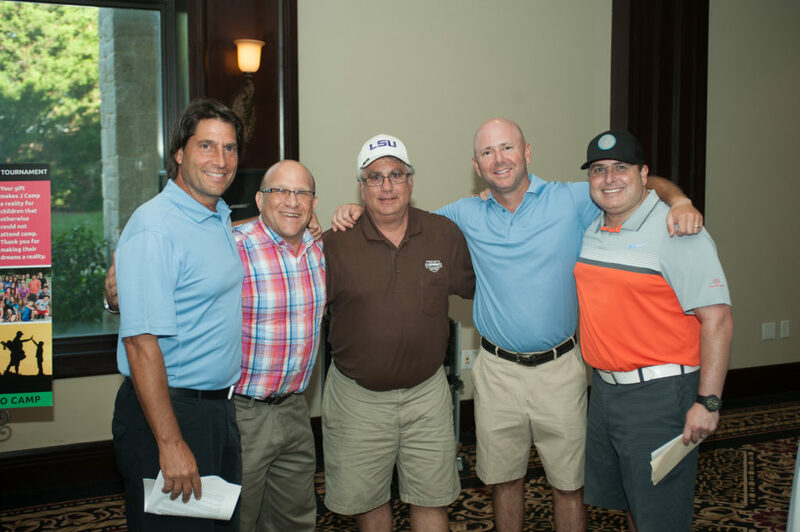 This year the tournament hit a new record, raising more than $164,000 for the Joanie I. Weinstein Camp and Elaine Schrager Preschool Scholarship Funds at the Aaron Family Jewish Community Center. The hard work of Golf Co-Chairs Clay Aaron, Scott Cohen and Neil Goldberg made the day a success. The late Erwin Waldman was a tremendous leader who impacted the community with his passion and commitment to providing programs and services to meet the needs of many. Scott Cohen, Erwin Waldman’s grandson and co-chair of the tournament for the past nine years, remarked, “We are amazed at the success that we have had over the past 29 years. My grandfather was very passionate that all children should be given the opportunity to attend a summer day camp. We had another record year with regard to fundraising, sponsorships and players. Papa Waldman would have been very proud! The tournament featured both morning and afternoon tee times; breakfast, lunch and an evening cocktail reception all catered by Simcha Kosher Catering; and an awards ceremony. Prize presentations were made to the first-, second-, and third-place golf teams. The raffle winner for the Mavericks/Stars American Airlines Center suite was Steve Ellington. The second Mishnah of Pirke Avot is one of my favorites. With four questions and four answers, we must look at all separately and then together. Why did Ben Zoma put these together? Who is strong? He who controls his passions. What does it mean to be wise? Is being wise different from being smart? How? Do you need to be old to be wise? Why or why not? How can you learn from everyone? What if they are younger than or not as smart as or very different from you? Why does learning from every person make you wise? What does it mean to be strong? Is it about having strong muscles or something different? What? What does it mean to control your “passions”? Why does that take strength? How do you use your inner strength to control yourself? How many different ways are there to be rich? What does it mean to you to be rich? Is it easy to be happy with what you have? Why or why not? Why does that make you rich? Finally, what does it mean to be honored? How do you honor others? How do they show they honor you? Why does honoring others make you honored? Are one of these qualities more important than the others? Why are they in the order above? Which is most important to you? And this quote of conflict begins Charles Dickens’ A Tale of Two Cities: “It was the best of times. It was the worst of times.” I remembered both during a recent meeting with yet another orthopedic surgeon about my ongoing knee problem, because from this man I finally got a definitive “diagnosis,” although certainly not what I’d been hoping for. Second quote first: It was the worst of times when I received this doctor’s information, but it was the best of times when I realized that my long, futile search for improvement was finally over. First quote second: There’s something remarkably freeing about getting the final answer to a long-asked question, even if it’s not the answer you want. It signals change, points to new direction, makes what you must do achingly clear: Adjust. I will be living the rest of my life with the nasty knee I already have. The backstory: In early 2008 I had a very “routine” left-knee replacement due to the wearing away of all its cartilage. No problems until I took a disastrous fall late in 2012, breaking that same knee and my left femur at the same time. Both hip and knee were repaired in a single major surgery, and the rehab that followed was fine, up to a point. But I never got beyond that point; the knee never worked again the way it had earlier. It would “freeze” if I sat too long in a normal feet-on-the-floor position; then, straightening it out was a slow, painful process. And after the straightening, it resisted bending again. Things I never thought of before became major efforts: Sitting down. Standing up. Putting on a shoe. Pulling my leg into the car and getting it out again. Several doctors sent me for different tests to determine what was wrong; all hinted that something was not right, but none pinpointed what it was. And no X-ray showed any problem with the replacement itself. So I finally I learned from this new specialist that my current condition is “normal” after the “abnormal,” highly specialized knee replacement I now have. Other doctors had told me that a different kind had been required, even hinted at how different that kind is. This doctor finally talked truth: It’s used only in cases where everything in the knee is damaged — tendons, ligaments, muscles, blood vessels, etc. — not just the bone itself. It’s called a “tumor replacement” because that’s what most people who need it have. It’s the ultimate — what my father, a doctor himself, would have termed “ne plus ultra:” nothing beyond. No more can be done. Maybe the others didn’t want to be, or just couldn’t be, the bearer of these bad tidings, but “No doctor would touch this now,” the truth-teller said. My rock-solid knee will never again flex normally. What I thought was temporary is certifiably permanent. But I’m lucky it flexes at all! My father also used to say that none of us has a choice of physical problems: “You get what you get, so just take whatever life hands you and do the best you can with it.” His wise words will now define my lifestyle. I’ll continue with the cane, keep on seeking seats where I can fully extend my left leg, and stop assuming that all this will be over sometime in the future. This is the best of news, and the worst of news: My future is now. And the truth has set me free to bless God, for had this been my right leg, I wouldn’t be able to drive at all! Flannery O’Connor parodied John: “The truth will make you odd.” I always thought that was a bit strange, but now I understand, and I accept it for myself.